Oak frame garden rooms range from cabins, huts, summer houses and sheds, and are perfect for rustic or period-style gardens. Generally built as permanent structures to create extra living space, a functional room, such as a home office or garage, or a storage area, oak frame buildings are hugely desirable and valuable. Their appeal lies in the rustic, natural charm of the materials used. Oak frame buildings can be expensive, but many would argue that their handmade appearance and the knowledge that they are constructed using traditional methods, make them a worthwhile investment. Available fully insulated, wired, heated and plumbed and with all manner of bespoke features, built in, oak-frame garden rooms don't have to be reserved for the summer months and can be practical spaces all year round. Explore these oak frame garden room ideas and helpful tips to inspire your project and find out all the practicalities of building a garden room with our guide. This Four Seasons pavilion by Oakwrights Country Buildings could serve many purposes, including garden office or guest room. Picking materials, such as roof tiles, that blend well with your home's existing architecture will help the garden room blend in. Whatever the size and concept, traditional oak frame buildings have changed very little in style over the centuries; it is the scale and erection methods that have changed, with the basic structural frame built in four sections comprising wall, floor, roof and cross. Considering creating a live-in annexe, rather than an attached extension? 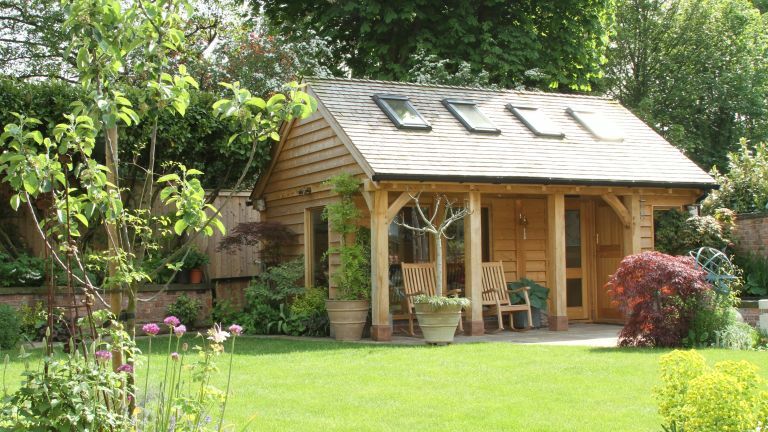 An oak-framed garden building is a good way to create a harmonious, sympathetic addition. Homeowners often use a ‘design to completion’ company, which can involve the architect of the whole build working in partnership with the oak frame manufacturer or company. Alternatively they may commission specialist oak frame constructors for individual parts of the project. Find out more about building an annexe in our practical guide. Unless your house is listed or located in a Conservation Area, you will not need to apply for planning permission, as long as your building meets certain restrictions to fall under permitted development . For this, the structure should be one storey high, not on land at the front of the house, and not more than half the area of the land around the original house. Log on to the planning portal for full details of restrictions. Many of the oak frame buildings seen today are built with a particular eye on their ecological credentials, with many homeowners interested not just in the appeal of natural materials and user-friendly construction methods, but also in the environmental impact of oak construction timbers as carbon neutral building materials. The environmental advantage of wood is its natural absorption of CO2. When wood is burned, it releases the amount of CO2 that it absorbed during its lifetime. However, if timber is used for long-term structural purposes, such as house building, the carbon is removed from the atmosphere, and the wood can be of use for hundreds of years, with the result that timber can be considered carbon neutral. The oak must be sustainably sourced, often from France, but this could also be from England. Green oak needs no chemical treatments or preservatives and using local suppliers can lessen the environmental impact of transportation. Most suppliers of oak framed buildings are keen to promote the idea of individually designed, bespoke buildings. There are few cost advantages in buying an off-the-shelf oak framed building, as homeowners are keen to have individually designed, unique buildings that are designed, built and adjusted to fit their own particular needs and plans. Meet with at least a couple of suppliers to compare the services which are offered. All reputable companies will offer facilities that can encompass preparation of plans, submission of planning applications, and liaison with the local authority planning departments. Remember to consider groundworks, landscaping and other associated upheavals; designing and installing or building an oak framed building is a rather larger project than adding a summer house or gazebo to your back garden. If the structure is subject to building regulations, it's best to get an expert involved. If you're unsure, ask your local authority, but in general providing it's internal size is less than 30 sq m, it is not sleeping accommodation, and is at least two metres from any boundary, it is exempt from building regulations. A good sized oak frame garden building should be designed with insulated floors and roofs, using toughened and double glazed panels that provide further insulation, so that the room is comfortable and pleasant to use whatever the weather. This stunning oak-frame garden room has served as an artisan studio for engraver Andrew Davidson for the past 26 years. Now beautifully weathered to a silvery finish, it was constructed from pegged oak to his own design. Nicknamed his 'gilded cage', the building is reminiscent of a boathouse, but instead of river views it offers vistas across the Cotswold countryside. ‘If one must be imprisoned for life, it has to be in a gilded cage,’ he quips. Find more beautiful garden rooms like this in our design gallery. If your house is in a rustic setting, a garden room extension in oak will be the perfect choice – whether the property has a distinctly period feel or not. Find out more about building an oak frame extension to your home in our practical guide. If you're building a garden room as a living space, it makes sense to invest in on-show oak for the interior, too. Choosing an interior style that matches that of your home will help make the transition from indoors to out to the garden room seamless. Homeware haven Made.com are offering customers 20 per cent off selected products as well as free delivery. Hurry, deals finish today!